Minks have inherited 1 Burmese gene from 1 parent which gives them color at birth. Their fur is thicker around each hairshaft and they are softer and pointed with medium color. Sepias have inherited 2 Burmese genes 1 from each parent. Their coats are 2x as thick and dark and luxurious. Very rare in the Ragdoll world. Perfect example of a traditional seal mitted ivory body, Sepia Seal Mitted with the rich dark color, and the Seal mink mitted lighter brown coloring. 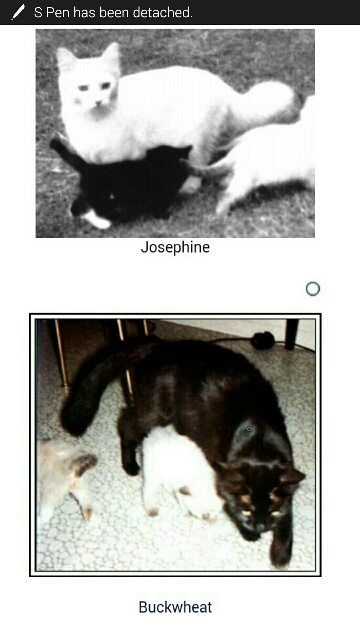 If you search the early pedigrees of Ann Baker’s cattery, you will see that Josephine was a solid white cat, and Buckwheat, a solid black cat. This shows that solids can be traced back to the very first Ragdolls. Solids are purebred Ragdolls and have the same wonderful personality as the traditional pointed variety of Ragdolls. I understand that there are around 40 breeders world wide continuing with these rare old lines of solids. This is an exciting time as I was only the 5th breeder in the USA to work to save these very rare and precious colors. Solid Ragdolls are born with full color, unlike the traditional pointed Ragdoll. 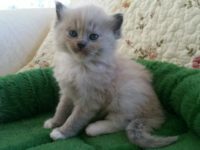 Solid Ragdolls can give birth to solids, as well as traditional pointed kittens. 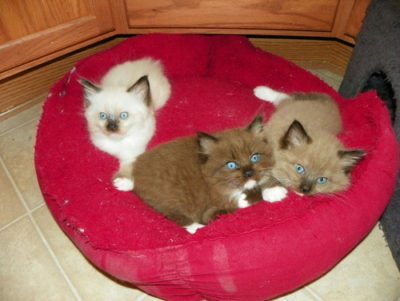 Solid Ragdolls bred to a traditional Ragdoll will produce 75% solid kittens and 25% traditional kittens. Solid Ragdolls have gold or green eye color. Solid Ragdolls come in all of the traditional colors including black, smoke or silver as well as all the traditional patterns. They come in 3 patterns mitted, bicolor and pointed as well as tortie, and lynx. Ragdolls come in the six different colors-seal, chocolate, flame and the corresponding dilutes such as blue, lilac and cream. All traditional Ragdoll kittens are born white. 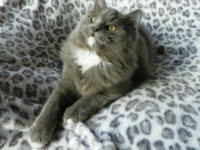 They have good color by 8-10 weeks and full coat color at 3-4 years. Ann Baker purchased several kittens from the owner, who lived behind her, and believing she had something special, set out to create what is known as the Ragdoll. The breed was selectively bred over many years for desirable traits, such as large size, gentle demeanor, and a tendency to go limp when picked up, as well as striking pointed coloration. Out those early litters came Blackie, an all black Burmese-like male and Daddy Warbucks, a seal point with white feet. Daddy Warbucks sired the founding bi-color female Fugianna, and Blackie sired Buckwheat, a dark brown/black Burmese like female. Both Fugianna and Buckwheat were daughters of Josephine. All Ragdolls are descended from Baker’s cats through matings of Daddy Warbucks to Fugianna and Buckwheat. Baker, in an unusual move, spurned traditional cat breeding associations. She trademarked the name “Ragdoll”, set her own registry International Ragdoll Cat Association IRCA and enforced stringent standards on anyone who wanted to breed or sell her cats under that name. 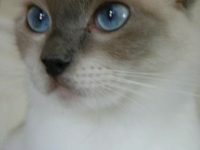 The Ragdolls were also not allowed to be registered in other breeders associations. 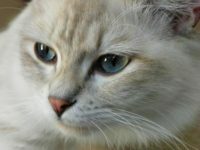 In 1975, a group led by Denny Dayton broke rank with IRCA with the aim of gaining mainstream recognition for the Ragdoll. This group eventually developed the Ragdoll standard currently accepted by major cat registries. After several selected generations of breedings, the Ragdoll was established. Ann’s first pair was said to be a white Angora(Ann told friend that Josephine (mother of the breed) was Angora/Persian x Turkish Van) and (father of the breed) was a Seal Birman, (it was more likely Daddy Warbucks. Ann Baker is credited with the introduction of this new breed. Breeders after her have built this breed up to the standards of the CFA and TICA.